Mizz Lizzy! You are the cutest, sweetest looking pooch on the planet! Thanks for checking in and letting us catch a glimpse of you! Wow, that is crazy! Maybe the corgi owner personality type is one that doesn’t like living in big cities. Ha Ha. Strange. Whenever I’m in New York I see lots of pugs. SO cute — corgis are so adorable. For some reason I have never seen one in NYC! Hi, Lizzie. Long time since I’ve heard from you. Are all the humans in your house giving you lots of treats? I sure hope so!! We had aig thunder storms last night. I was so scared. I jumped in bed with mommy. She was scared, too. Daddy went to a ham radio convention this weekend. He will be home on Sunday. 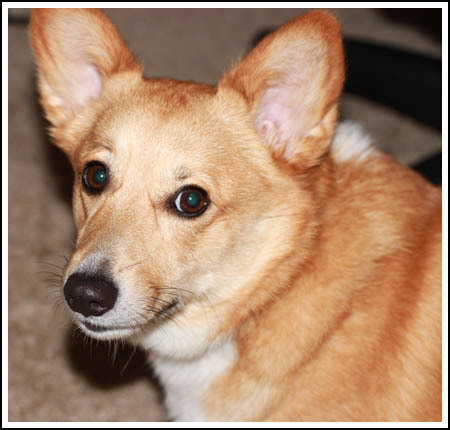 She is adorable – I have a corgi as well, his name is Elvis. Have a good weekend!